Hiya guys! The next few days my nail length will be doing a magic growing and shrinking trick. Haha, no really I wish it worked like that cause it would be amazing. I had a bad break while opening some nail mail, oh the irony there. So I'll be part of the shorty club for the next few weeks, which surprisingly I am not minding. Then again, it could just be these polishes because they are so beautiful! 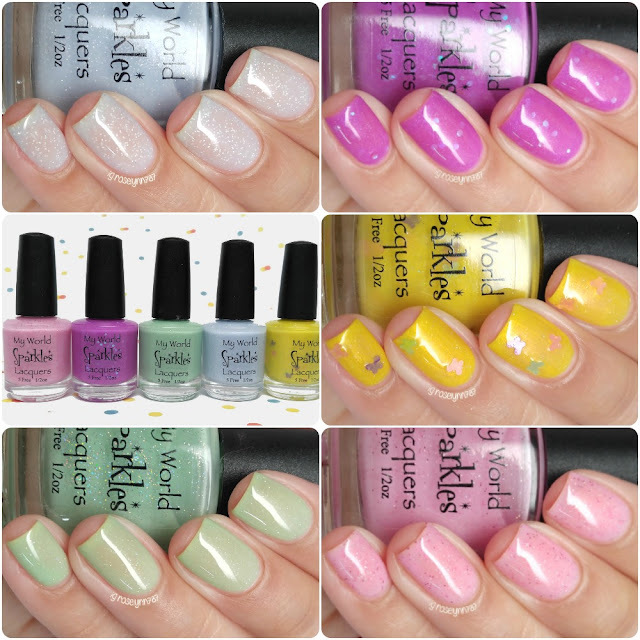 Today I'm sharing swatches for the Kisses Collection by My World Sparkles Lacquers, which is a five piece glitter collection. Let's go ahead and get started. The Kisses Collection by My World Sparkles Lacquers officially releases on April 16th. Pre-Order is available right now, pre-order sale price is valid until April 16th. Each full-size bottle retails for $8.00 each and the complete set can be purchased for $30.00. You can receive an additional 10% off by using my coupon code: M&M10. Sweet Kisses can be described as a soft sheer pink color with various holographic and pink micro glitters. Tell me I'm not the only one who thinks strawberry shortcake with this cutie?! The formula for this one is really on the sheer side and even after some layering you can see a nail line. The good thing is the consistency has a great application and applies evenly on the nail. You can also use this as a topper to layer over a base for an opaque finish. Shown here in three coats and sealed with a glossy topcoat. 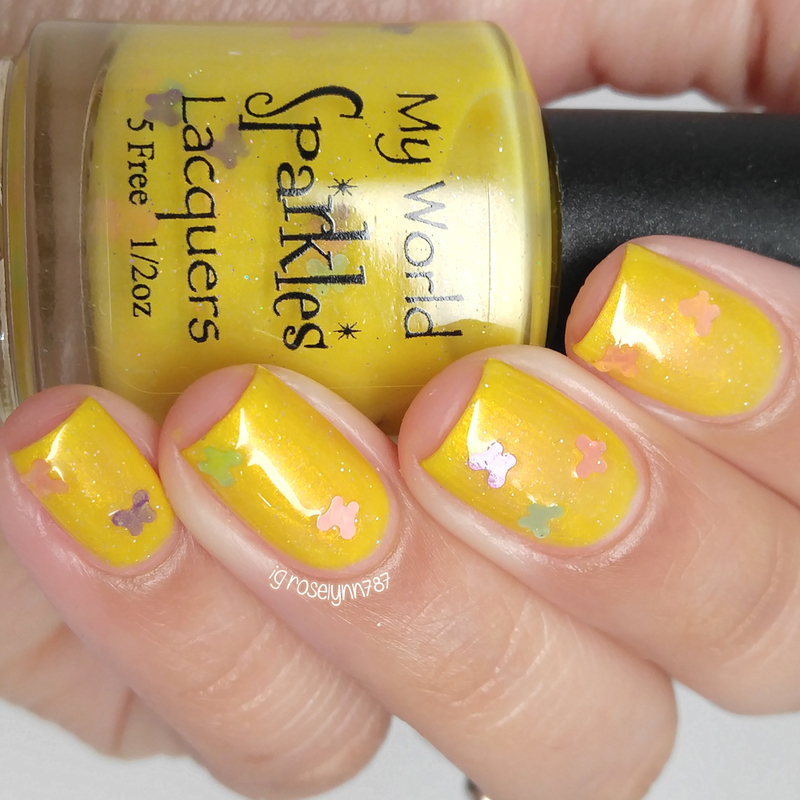 Butterfly Kisses can be described as a vibrant shimmery yellow color with various butterfly glitters. 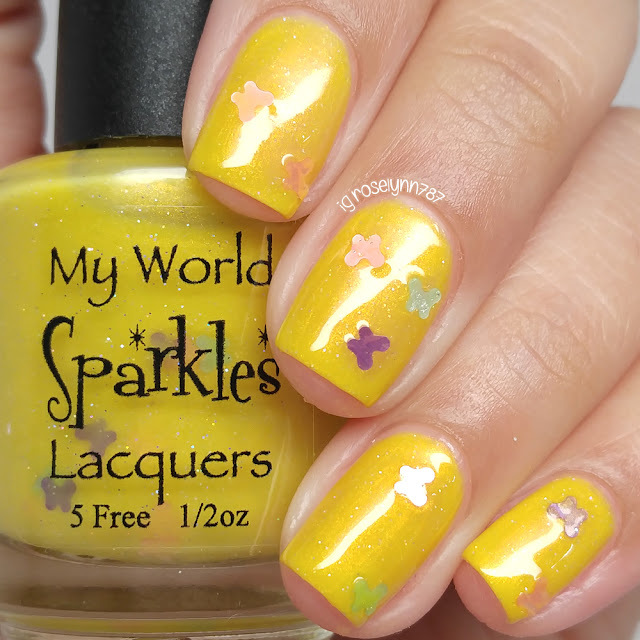 I have to be honest and say I'm not a huge fan of this one due to the butterfly glitters. They feel a little bit bulky on the nail and when I wear this again I probably won't fish for them. The formula is a bit more opaque compared to the others in this collection. Although for these swatches the butterfly glitters needed to be fished out for placement, the maker will be adding more glitters for the batches on release to eliminate that issue. Shown here in two coats and sealed with a glossy topcoat. Eskimo Kisses can be described as a soft sheer iced blue color with white and sparkly glitters reminiscent of the fallen snow crystals that sparkle in the light. The sheerest in the collection and surprisingly my first pick as a must-have. It's such a lovely shade, with the sheerness adding to the overall delicate feeling this polish is going for. The formula, as I mentioned, is extremely sheer and will show your nail line even after some layering. It has a bit of a jelly-type of application and builds up evenly on the nail. Shown here in three coats and sealed with a glossy topcoat. Heavenly Kisses can be described as a orchid crelly color with a multitude of iridescent translucent glitters. Sharing a similar formula as Butterfly Kisses, this one tends to be a little more opaque then some of the others. The larger hex glitters don't need to be fished out, however they do need a little dabbing so as not to clump. Shown here in two-three coats and sealed with a glossy topcoat. Puppy Kisses can be described as a soft sheer mint green color with holographic micro glitters. This is my other pick for a must have! I am so love with the uniqueness of the shade and the subtle glitters give it the perfect finishing touch. The application and formula are smooth and builds up to an almost a fully opaque finish. Shown here in three coats and sealed with a glossy topcoat. Overall I have to say I ended up loving these much more I originally thought I would. I'm not one for sheer polishes (where my nail line is visible), but these ended up being the rare exception to that. My personal picks for must-haves are Eskimo Kisses and Puppy Kisses. The sheerness ended up giving these such a soft and dainty feel, perfect for the whole blossoming of Spring mood. How do you guys feel about sheer polishes? Which one is your favorite? 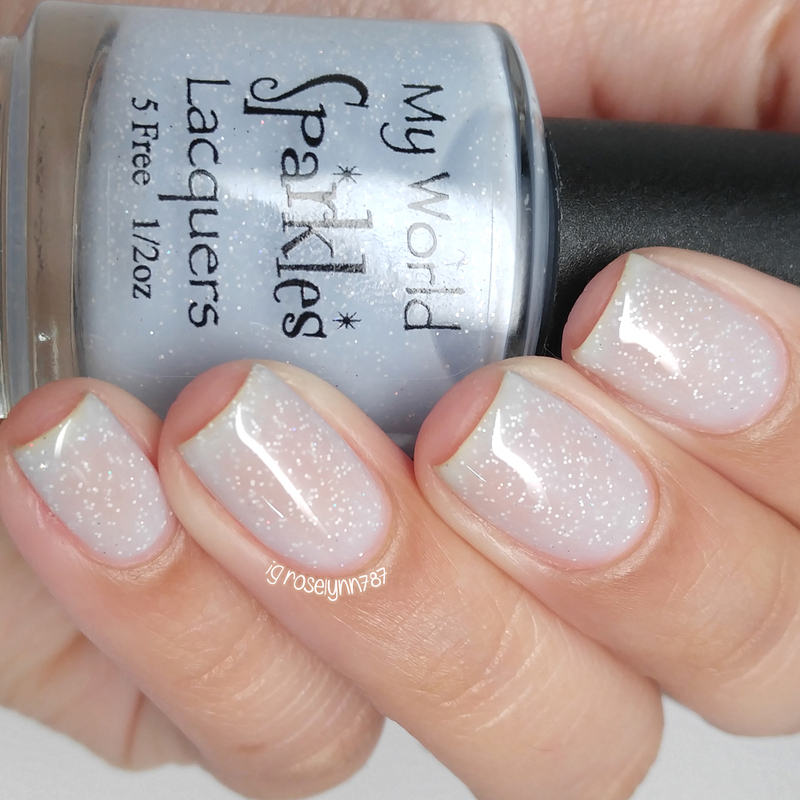 To recap, the Kisses Collection by My World Sparkles Lacquers officially releases on April 16th. Pre-Order is available right now, pre-order sale price is valid until April 16th. Each full-size bottle retails for $8.00 each and the complete set can be purchased for $30.00. You can receive an additional 10% off by using my coupon code: M&M10. eskimo kisses is the best. I think Heavenly Kisses is my fave. This is a new brand to me, so I'm loving seeing your swatches.